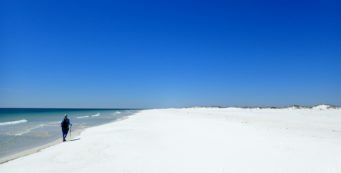 St. Marks | Florida Hikes! A fishing village at the confluence of the St. Marks and Wakulla Rivers, the town of St. Marks is also the end point of the Tallahassee-St. Marks Historic Railroad State Trail and an excellent place to base camp while visiting St. Marks National Wildlife Refuge. 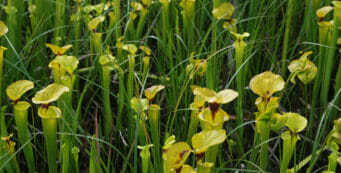 Apalachicola National Forest- The Apalachicola National Forest is the largest National Forest in Florida, sweeping around the southern edge of Tallahassee. 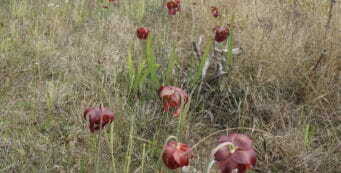 It is noted for its botanical beauty. 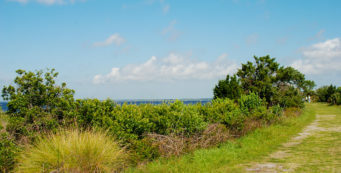 Cedar Point Trail- Tunneling through the shade of coastal cedars between open marshes and the boat channel from the saltwater boat ramp to the Gulf of Mexico, the Cedar Point Trail is a short walk to the Gulf 's shores. Exploring San Marcos de Apalache- Where the Wakulla and St Marks Rivers meet, explore San Marcos de Apalache Historic State Park, a small piece of ground with a deep history under five flags. Florida Trail, Apalachee Bay- 14.3 miles. 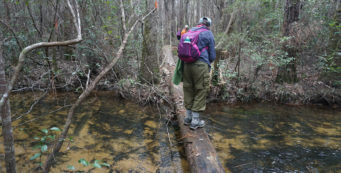 Hugging the Big Bend coastline, this hike through Aucilla WMA and St. Marks NWR offers some of the most breathtaking panoramas you'll find along the Florida Trail, and a profusion of wildlife. Florida Trail, Shepherd Spring- 5.3 miles. 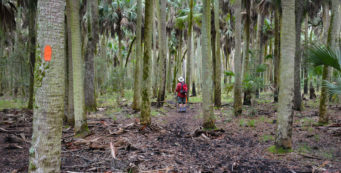 Plunging into coastal swamps at the Cathedral of Palms, this popular hike along the Florida Trail centers on Shepherd Spring, a natural treasure within St. Marks National Wildlife Refuge. Lighthouse Levee Trail- A windswept walk along the Gulf of Mexico, the Lighthouse Levee Trail provides scenic panoramas of both the Gulf and marsh impoundments near the St. Marks Lighthouse. 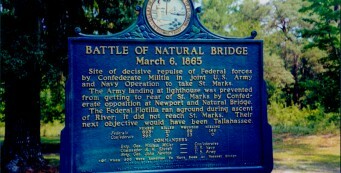 Natural Bridge Battlefield Historic State Park- At Natural Bridge Battlefield near Tallahassee, memorials and reenactments keep alive the spirits of the soldiers who perished on this spot during one of the last and largest battles of the Civil War in Florida. 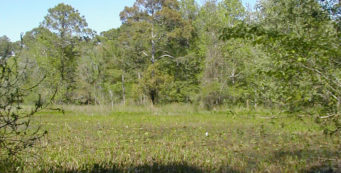 Plum Orchard Pond Trail- Starting adjacent to the Visitor Center at St. Marks National Wildlife Refuge, the Plum Orchard Pond Trail is an easy half mile loop that takes you out along Plum Orchard Pond, a great birding stop. 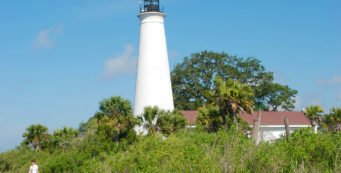 San Marcos de Apalache Historic State Park- The site of the first coastal fortress along Florida's Panhandle, San Marcos de Apalache Historic State Park protects several generations of battlements. 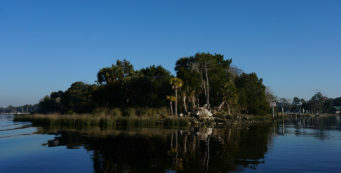 San Marcos de Apalache Trails- The site of the first coastal fortress in Northwest Florida, San Marcos de Apalache has a 0.6-mile historical trail at the confluence of two major rivers. 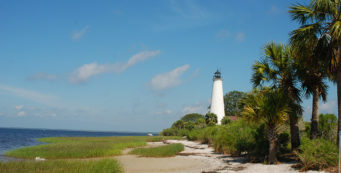 St. Marks Lighthouse- Built in 1842, the St. Marks Lighthouse played a pivotal role during the Civil War. Despite its light being quenched during the war, it remains a working lighthouse marking the location of the St. Marks River. 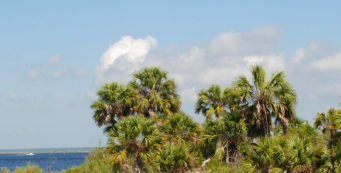 St. Marks National Wildlife Refuge- Stretching across 70,000 acres in Florida's Big Bend, St. Marks National Wildlife Refuge protects one of Florida's longest wild shorelines, more than 43 miles in three counties. 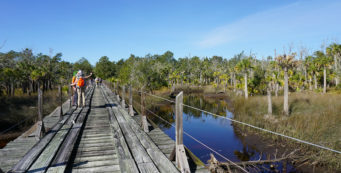 Tower Pond Trail- At St. Marks National Wildlife Refuge, the Tower Pond Trail loops a mile through vast impoundments and marshes along the Gulf of Mexico, providing scenic panoramas and great birding. Wakulla Springs State Park- A 1930s resort turned nature park surrounding one of the world's largest and deepest springs, Wakulla Springs State Park leads you back in time at the state's only state park lodge. 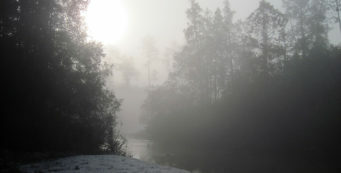 Wakulla Springs Trail- Looping around the floodplain of Wakulla Springs, the Wakulla Springs Trail provides up to 10 miles of hiking showcasing the variety of habitats along the river’s shores.